Great 4 bedroom, 2 bath home with private screened pool. 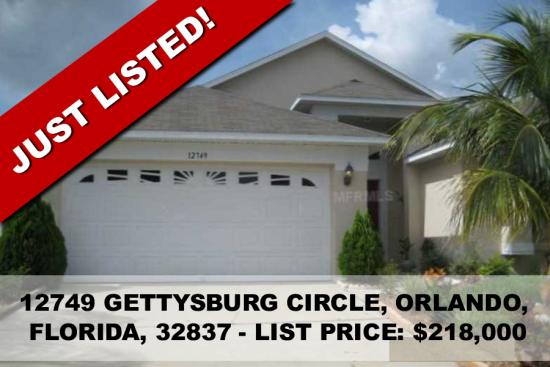 Located just off John Young Parkway, the location has easy access to all local amenities including theme parks and the airport, add to this A rated schools, makes this an opportunity you cannot afford to miss. The tiled entry way welcomes you to this spacious home. The 2nd bathroom has been remodeled this month. New carpet and paint through out the house including the garage, in a pleasing neutral color. The kitchen has its own eating space. The laundry room has a sink and leads to the garage. The living and dining areas are separated by an elegant archway and columns. The roof was replaced in December 2013 with a 5 year warranty that can be transferred to the new owner. The AC was replaced inside and out with a 13 SEER system. The house has a sprinkler system. All appliances will remain with the sale. Its move in ready.